Come celebrate the New Year with a laugh! 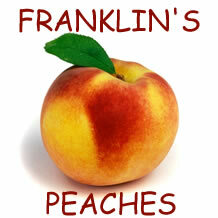 Franklin's Peaches returns to Playhouse on Park for a night of improv comedy on Saturday, January 2nd at 8 pm. Franklin's Peaches, renowned for their confident, high-energy style, will be joined by some of Hartford's best improv artists for a one night only performance. Performers include Casey Grambo, Mick Stinchon, Kevin MacDermott, Matt Saccullo, Jamie Guite, Kevin Sullivan, Laura Manasewich, and Claire Zick.